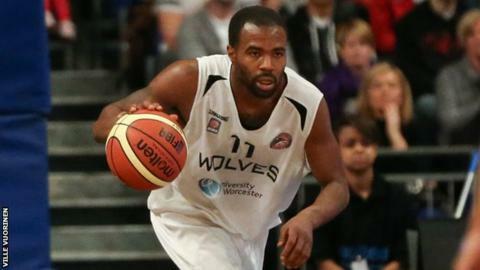 Worcester Wolves' Zaire Taylor has said he had pre-game nerves before leading his side to victory in the BBL Play-off final against Newcastle Eagles. The 27-year-old guard top-scored with 30 points, winning the game's Most Valuable Player award as the Wolves won their first play-offs. "Before I felt so much pressure," Taylor said. "It meant so much to all of us and I feel like we really needed this to close the season off the right way." Victory at Wembley Arena ended a fantastic campaign for Taylor as he picked up the league's Most Valuable Player award this term, after winning last year's final with Leicester Riders. It also capped off a memorable season for his team, having already won their maiden BBL silverware in March by beating Glasgow in the BBL Trophy final. And Wolves captain Alex Owumi said that he had confidence that the five players coach Paul James had picked to start the game would be capable of bringing home more silverware against BBL Championship winners Newcastle. "Hat's off to Newcastle for a great season," Owumi said. "We were neck and neck with them and Sheffield for the whole season. "But most importantly, I just want to thank our guys, coach and fans for a great game. "We had a great game defensively, and offensively we knew that in our starting five everyone was capable of shooting over 20 points. "Zaire came up big for us, the Williams brothers [Kai and Jamal] always come up big for us and Will Creekmore is just a great big guy."